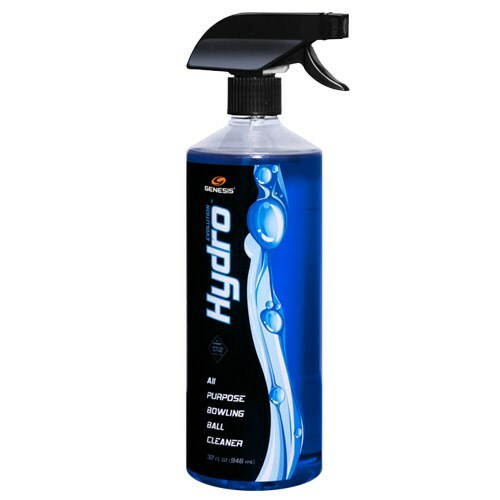 Evolution HydroTM is Genesis' all purpose ball cleaner. It has been approved for use during USBC competition, meaning you can clean your ball anytime you want. While being the mildest cleaner in the EvolutionTM line, it still has the power to clean most any contaminants from the surface of your ball. Dirt, oil, scuff or belt marks? No problem. The gentle, low odor, water based formula stays wet longer, aiding in the break down of tough to clean spots on the surface of your ball, giving you an effective way to clean your ball mid-competition, when other cleaners just aren't allowed. Due to the time it takes to produce the Genesis Evolution Hydro Blue 32 oz ball it will ship in immediately. We cannot ship this ball outside the United States.